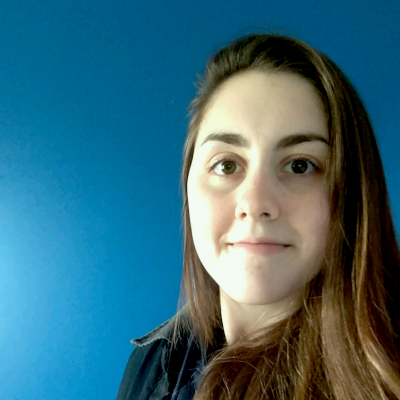 With RhinoCAM and students like Emma, we can rest assured that the future of furniture design is in good hands! Emma’s design is of the classic Memphis-Milano design style that appeared briefly in the early part of the 1980s and whose signature design characteristics were bright colors, simple geometries and a post modernistic style. Emma first sketched the design by hand and then modeled it in Rhino based on orphan pieces of wood that the shop had on hand. 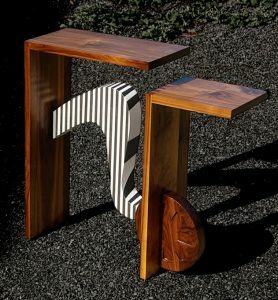 The curved panel is a 3” stack lamination of ¾” baltic birch plywood, the top desk pieces and wheel are solid walnut. The pieces are made with ready to assemble connectors, so she can take it apart and move it around. It’s a very fun and unusual design! (Main Image) A 3D assembly model of Emma’s design is shown in Rhino with RhinoCAM’s Machining Browser shown on the far left. (Inset Top & Bottom) Images of Emma’s completed design are shown. The wheel design encompasses both 2½ and 3 Axis toolpaths. For the daisy-chain pattern of contoured pockets, Emma chose the 3 Axis Horizontal Finishing operation using a ¼” Flat Mill with the stepdown set to 5% (0.0125”). Notice that the only geometry selected is a 9.7” diameter planer circle. Also known as Z-Level Finishing, the operation calculates the Z depths required within the containment area while compensating for the tool diameter. The next operation is 2½ Axis Pocketing using a ⅜” Flat Mill. This is used to separate the wheel into two the two parts her design requires. Notice that the only geometry needed here is a planar rectangle measuring 1.14”x 11.89”. The pocketing operation cuts within the containment area at a total depth of 1.5” set to 10 levels of 0.15” each with an initial 10 degree ramp entry moton. 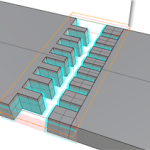 The remaining 2½ Axis Profiling operation uses the same ⅜” tool and cuts the outer perimeter at 0.2” cut levels. The part and toolpaths are shown below. (Main Image) The 3D model of the wheel component is shown in Rhino with the RhinoCAM toolpaths that were used to cut the part. From left to right we see the RhinoCAM Machining Browser, the Toolpath Viewer/Editor and the display of a 3 Axis Horizontal Finishing operation. (Inset Bottom) The completed cut material simulation showing the tool cutting the 2½ Axis Profiling operation. (Inset Top) The completed design showing the wheel component in place. The Stretcher is the panel that connects the two vertical walls of the desk. It runs from mid-height on the left to the base on the right, just behind the wheel. For this Emma is cutting four stretcher components from ¾” Baltic Birch plywood that will be laminated together to form the completed component. Also included in this operation are four Glue Supports used during assembly. The 48”x48” stock for this operation is displayed in RhinoCAM below. We see that Emma is using a 2½ Axis Profiling operation with a ¾” Flat Mill. For Control Geometry, only 2D closed curves lying on the XY Plane (at the top of the stock definition) are needed. The cut will be completed in three levels of 0.225” each. If you look closely you can see that Emma has enabled the automatic placement of Bridges/Tabs from the Advanced Cut Parameters tab of the Profiling operation dialog. Each closed profile will contain a total of six (6) triangular tabs measuring 0.2” wide and 0.1” tall. These tabs will serve to help stabilize the part and stock during machining. 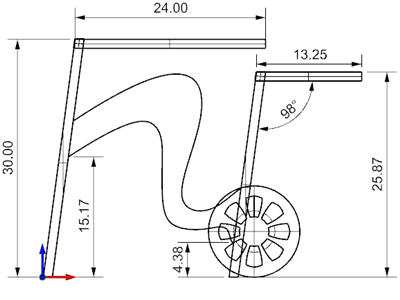 The Bridges/Tabs section of the Cut Parameters tab is also shown below. (Main Image) The 2D curve geometry representing the layout of glue supports and stretcher laminate components are shown in Rhino with the 2½ Axis Profiling toolpath created in RhinoCAM. 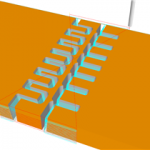 (Inset Top) RhinoCAM cut material simulation showing the automatic placement of Bridges & Tabs (Inset Bottom) The Bridges & Tabs section of the 2 ½ Axis Profiling Advanced Cut Parameters tab shows the Bridges & Tabs parameters for the job. 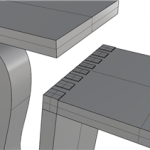 In Emma’s design, Finger Joints are used to attach the two horizontal components to their vertical counterparts. What’s interesting here is the angles required. 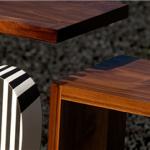 The vertical components are each 98 degrees from horizontal, making the finger joints more complex than usual. For this Emma again chose the 3 Axis Horizontal Finishing toolpath, this time using a ¼” Flat Mill set to a 20% stepdown distance. Emma’s design layout with dimensions. The Finger Joint components, toolpath, cut material simulation and final product are all shown below. Notice that only a simple planar rectangle (shown in the top-left image) is needed to contain the 3 Axis Horizontal Finishing toolpath to the required area. Great Job Emma!